1. Buy the replacement shock absorber kit here. 2. Front Shock Absorbers: Remove the front panel or lower cover panel. Rear Shock Absorbers: Remove the rear panel (12, #20 torx screws around the rear panel). 3. Remove the shock absorber nuts under the rear plate. 4. Support the holder from underneath or secure it with a hook from above. 5. Compress the shock absorber. Angle it outwards and pull it off downwards. 6. Take off the piston rods. 7. Remove the rubber buffers. 8. Install new rubber buffers (included with the new shock absorber kit). 9. Compress the shock absorber and put it into position in the bottom plate. 10. Fit the nut on the underside and tighten it. 11. Front Shock Absorbers: Replace the front panel or the lower corner. Rear Shock Absorbers: Replace the rear panel. 12. Pop a cold one and buy me one while you’re at it. Domo! 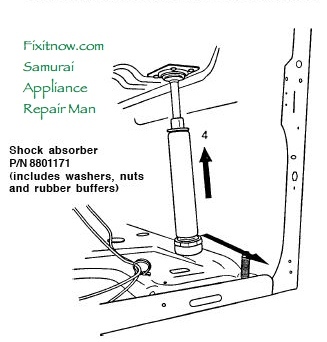 This entry was posted in Washer Repair on December 9, 2009 by Samurai Appliance Repair Man.